Any manufactured object that is deliberately or unintentionally discarded ends up in streams, rivers, lakes, or carried to the ocean is considered marine debris. These can range in size from microscopic clothing fibers that are not captured at wastewater treatment plants to old tires and appliances. 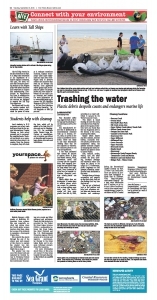 It has been estimated that around 80 percent of marine debris is from land-based sources. Learn more in this week's NIE page.